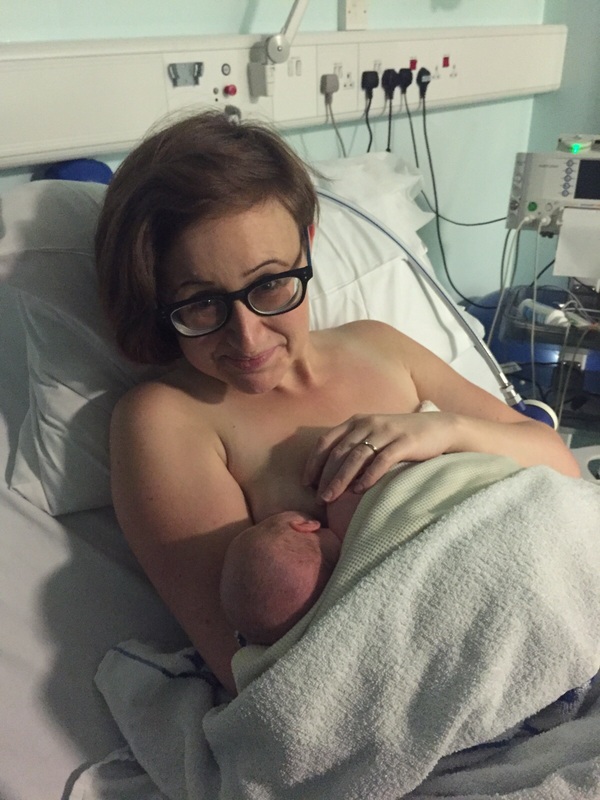 Cora' s arrival - Laura and Rich planned a home birth, but when they decided induction of labour was the safest option for them, they made it a positive exxperience! Laura writes: Thank you so much to Barbara of Romsey Relax for her support and enabling both me and Rich to be sitting here today feeling empowered rather than deflated and bullied. I know I have been very lucky to have relatively straightforward labours and that hypnosis techniques would be unable to prevent any inevitable complications, I do however think that Natal Hypnotherapy truly is a wonderful tool that can benefit everyone who is interested in it and that they should be given the opportunity to experience it. 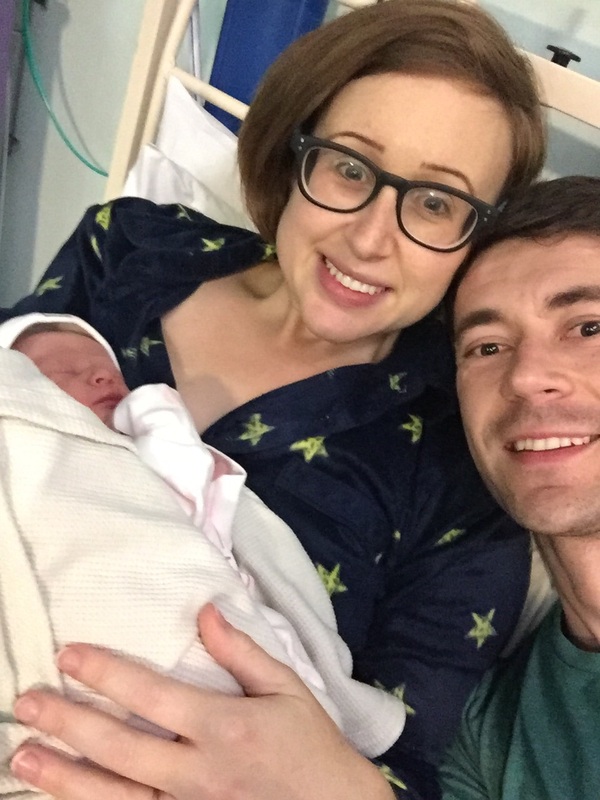 Cora’s arrival : Laura and Rich's Birth Story @LOZ83g ..
Cora arrived on Friday 30th October, unfortunately on labour ward after induction as there were concerns around her size and my placenta function. 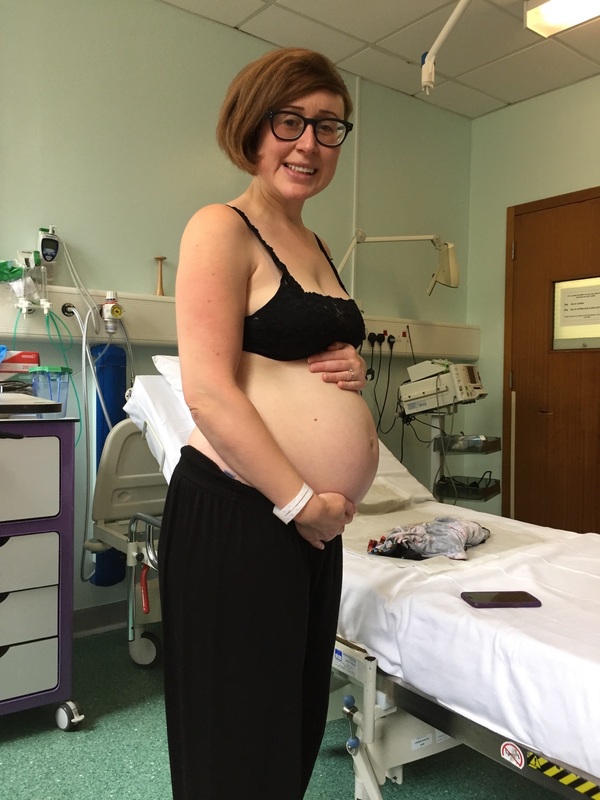 I delayed induction for a week with monitoring every second day to ensure she was happy – she was on every trace so I asked to speak with a consultant the day before the planned induction appointment so I could be involved in the decision making based on the information they could give me. 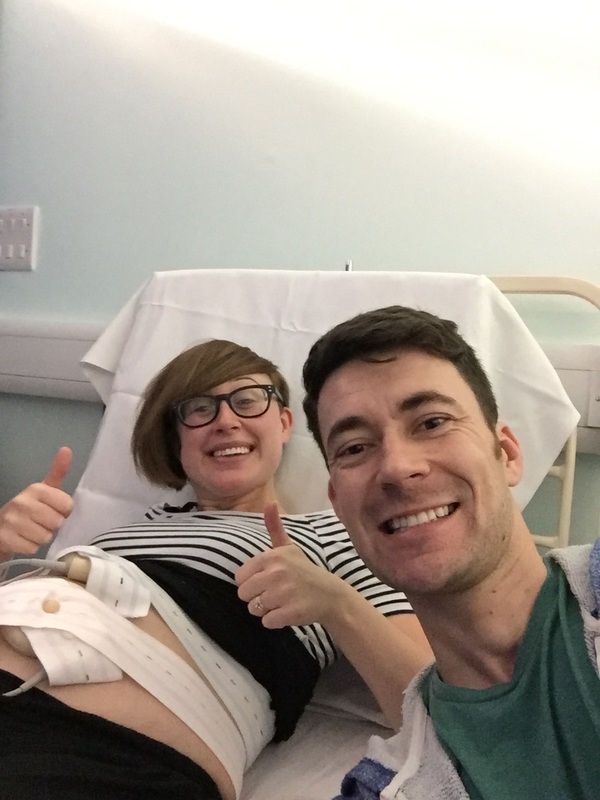 The doctor felt she couldn’t be confident that my placenta was functioning fully and recommended induction as the safest option – after a fully natural homebirth with my son I wasn’t keen but both my husband and I felt if we were advised out was safer than in for our baby, to ignore it would be foolish and selfish…so our induction appointment for the Friday morning remained and I went home to prepare practically, physically and mentally! Once Rich was home from work we went out for our last meal as a three – it was so emotional spending that time with Ted, knowing it was his last evening as an only child and it felt really odd knowing the day our baby would be born in advance. I practiced Natal Hypnotherapy hypnobirthing methods throughout my pregnancy and knew I would need to call upon them even more now in order to remain calm, positive and in control. My husband was so supportive of the methods and knew I wanted things to be as natural and intervention free as possible, I knew with complete confidence he would be my advocate throughout and make sure nothing happened unless it was necessary in order to keep myself and our baby safe. We arrived at 7.30am and after all the checks it was decided that I was advanced enough already to just have my waters broken and then see if everything else could progress naturally. Initially the most uncomfortable part was having liquid trickling for the next 7 hours!! We walked, we ate, we chatted and we laughed – Rich even said how much he was enjoying the time together as it was so rare (and about to become even more so!) We popped back to be allocated a room and have traces done every few hours to ensure baby was happy. Do Doctors did their rounds at about 2pm and suggested an oxytocin drip to speed things up, something I wasn’t keen on, they were accepting of this and it was agreed we would review the situation at 9pm. 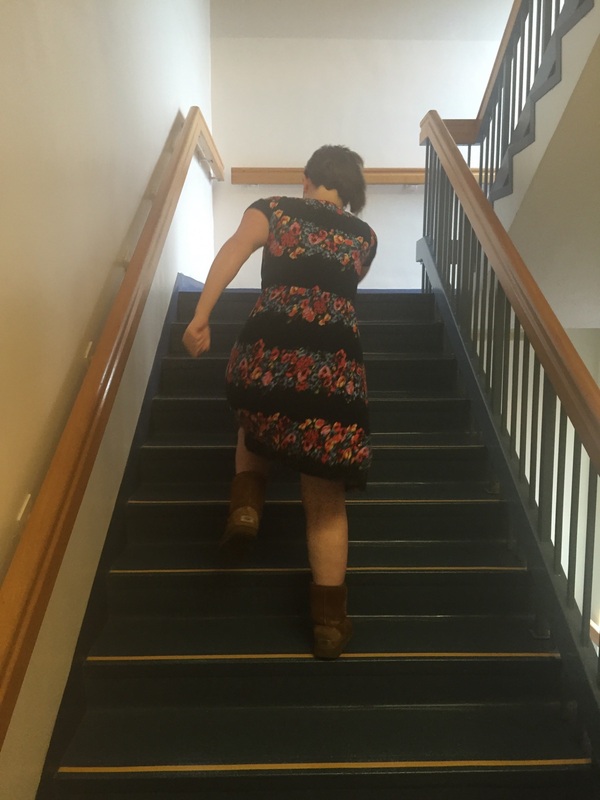 We kept active, pacing the corridors and stomping up staircases, I could feel things progressing slowly and had confidence in my body, I was controlling everything and maintaining a calm approach even when a pushy abrupt doctor tried to force me onto an oxytocin drip when my contractions slowed due to monitoring despite the earlier arrangement. I knew I was progressing and that the machine was just failing to pick up my contractions despite his claim “these contractions are not going to get your labour started” I refused and got quite upset at his approach and insistence without examining or talking properly with us or the midwife with us. Rich stepped in though and was amazing, asking them to remove the monitor and leave me to my own devices for another hour and a half (the agreed 9pm) unless there was a concern for either myself or Cora, which there wasn’t. I then refocussed, plugged myself into my hypnobirthing mp3 and refused to let an appalling bedside manner ruin my focus. We then paced the floors, climbed the stairs and removed ourselves from the ward to be able to work together on what we had practiced in an environment we felt safe in… I was in established labour by 8.30 stopping approx every 2 minutes relaxing into and breathing through each contraction, we returned to our room just before 9pm and were told the ward was really understaffed at the change of shifts which would work in our favour as they would allocate us last and leave us to our own devices as we had requested but told us to buzz if we needed anything. At five past 9 I told Rich I thought I wanted some gas and air so he grabbed Nina, the midwife who had been looking after us before she clocked off and asked her for a mouthpiece, as she left at 10 past she appologised she couldn’t stay until our baby arrived but we all thought it would still be quite a while and it was Friday night! As my next contraction came I took a drag on the G&A and told Rich I thought I needed to push!! A lovely old school midwife came to his rescue and encouraged me onto the bed (apparently kneeling ready to deliver a baby onto a hard hospital floor isn’t deemed the safest!) I managed to make it onto the bed, staying on all fours and rocking. The midwife told me she thought one good push and I’d have a baby…it actually took two and at 9.28 our darling daughter arrived looking the image of her big brother. I used nothing but the techniques we practiced and about 10 puffs of gas and air for pain relief and I cannot explain how proud I am we were able to manage the situation and the labour in the way we did. I know without the relaxation techniques and the confidence they gave us I could very easily have lost control and ended up with a very different delivery. Thank you so much to Barbara of Romsey Relax for her support and enabling both me and Rich to be sitting here today feeling empowered rather than deflated and bullied. I know I have been very lucky to have relatively straightforward labours and that hypnosis techniques would be unable to prevent any inevitable complications, I do however think that Natal Hypnotherapy truly is a wonderful tool that can benefit everyone who is interested in it and that they should be given the opportunity to experienceit.